This weekend Julie and I had a little gathering for Cara to celebrate her second baby girl. She is working so hard on her dissertation - GO CARA GO - so it was such a blessing to pause and celebrate her sweet little love bug on the way. 2- Cara is in need of a name and loves old traditional names. So all the ladies went around and said their grandmother's names... Loving Nora and Fern. 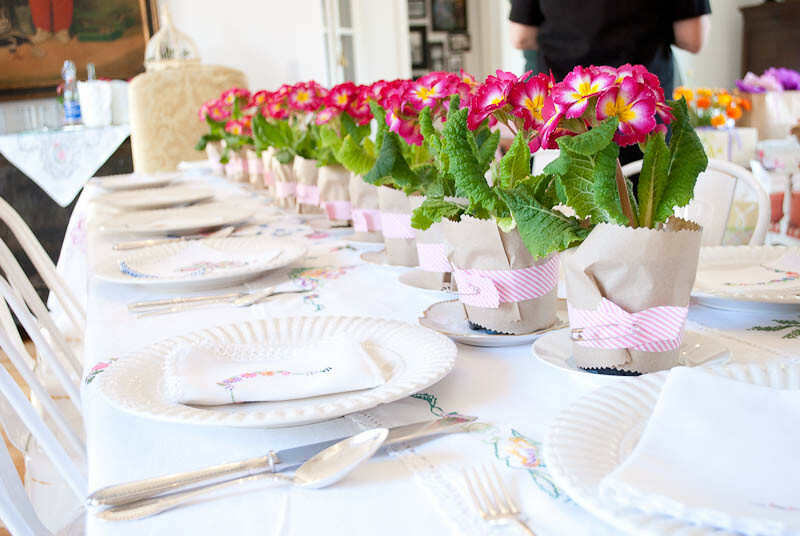 I did the potted plants idea at my wedding and also used them as table number markers. Such a great idea! I love when you share photos of the celebrations you host, both for holidays and for your friends. They are always so lovely down to every last darling detail. This is a beautiful table and I love the idea of sharing grandmother names. My great grandmothers were Elsie and Stella and my French Grandmother was Lilette. Love all three of those names so much it hurts. I love the tradition of using grandparent names! Love these ideas! The table looked beautiful!! Xo! Plotted plants is genius!! Love them. awww they look so pretty! very pretty table...and what a lovely idea to go around and say your grandmothers names. I love Fern too!